LONDON (AP) — Sergio Aguero is scoring for fun, and even referee Mike Dean got in on the japes. Only Chelsea had nothing to smile about after a 6-0 humiliation at Manchester City. Spotting Aguero on the field after the final whistle, Dean tucked the bright yellow ball up the back of his black referee’s jersey. Feigning ignorance about the location of the ball, Dean shrugged his shoulders before retrieving it from under his top for a beaming Aguero. This was a day of misery for Chelsea — the west London club’s heaviest loss in 28 years — but one for both City and Dean to flaunt their flamboyance. When it came to awarding the penalty that allowed Aguero to complete his hat trick — after spotting Cesar Azpilicueta’s foul on Raheem Sterling — Dean pointed exuberantly at the spot while jumping dramatically to end up in a pose with his legs outstretched in a squat. English football’s national stadium remains the temporary home of Tottenham where the north London club beat Leicester 3-1 in Sunday’s other game. It strengthened Tottenham’s hold on third place and left Mauricio Pochettino’s side only five points behind City and Liverpool. Since a shock loss at Newcastle, Pep Guardiola’s side has now won three games in eight days. 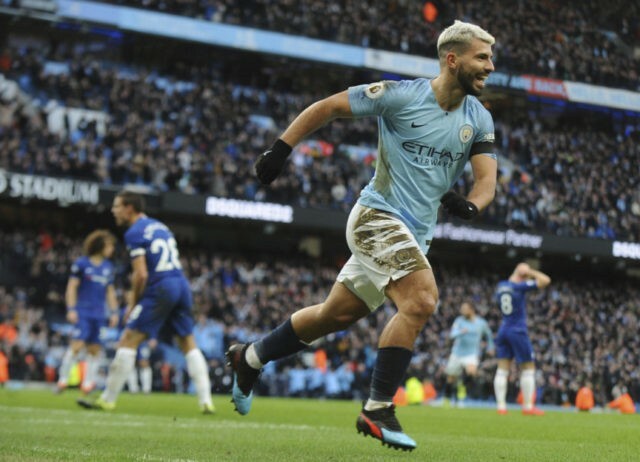 After Antonio Rudiger’s poor clearance, Gundogan slotted in the fourth in the 25th before Aguero netted the penalty that completed his 15th City hat trick in all competitions in the 56th. Sterling’s tap-in after being picked out by Oleksandr Zinchenko in the 80th completed Chelsea’s heaviest loss since Nottingham Forest beat the west London club 7-0 in 1991. Even without injured Harry Kane, Tottenham is reeling off victories. It’s now four out of four in the league without the team’s top scorer. But the 3-1 scoreline against Leicester didn’t reflect the nerviness for Tottenham. Davison Sanchez headed in Tottenham’s opener in the 33rd from Christian Eriksen’s corner. But on the hour, Leicester was awarded a penalty when defender Jan Vertonghen knocked over James Maddison. Eriksen then doubled Tottenham’s lead inside three minutes. Just as Leicester pressed for an equalizer, Son Heung-min scored a breakaway goal in the first minute of stoppage time.